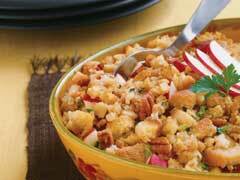 Get ready for Thanksgiving, and make our STOVE TOP Stuffing with Apples and Pecans recipe! Requiring just five ingredients, this fluffy STOVE TOP Stuffing with Apples and Pecans tastes delicious alongside a tasty slice of turkey. Prepare stuffing mix as directed on package, substituting orange juice for the water. Stir in remaining ingredients; cover. Let stand 5 min. Prepare using STOVE TOP Stuffing Mix for Chicken. Toasting nuts not only gives them a pleasing golden color but also intensifies their flavor and adds crunch. To easily toast nuts, spread them in single layer in baking pan. Bake at 350°F 8 to 10 min. or until golden brown, stirring occasionally.